Taken as a whole, Erie industry resembles a conglomerate — covering everything from organs to aerospace and mathematics to plastics. A diversified economy is more apt to survive with the times; while some parts may atrophy, others will grow, keeping precious talent and resources from bleeding out. While we have a ways to go in the recuperation process, the five unique companies listed herein signify there is hope. A community is made better by the compan(ies) that it keeps, and these companies aim to do just that by keeping well-paying jobs and well-credentialed people close to home. Dr. Ron Larson always loved teaching math; he just hated the way it was taught. As he watched his students struggle to grasp calculus, the limits of the Penn State Behrend professor's patience rapidly approached zero. Driven to produce a calculus textbook with the college student in mind, Larson set off to disrupt the status quo — he was the first to write his text according to the end design of the book (the layout was finalized first, then the text was placed to fit that layout, so nothing was broken across pages); he connected word problems to reality; all examples had a title. In 1976, after three years of rejection, he broke through in a major way. Over half of the publishers he submitted to (15 out of 26) accepted his manuscript; he and co-author Robert P. Hostetler accepted a contract from D.C. Heath and Company. The first edition of their calculus book sold 12,500 copies after publication in December 1978. As his reputation grew, so did Larson's range and outreach. In 1983, he hired two additional employees, officially establishing Larson Texts. They branched out from covering calculus to all college level math, gradually working down to encompass everything from kindergarten to 12th grade. By the 1990s, the growth had accelerated to the point that Larson added a CEO, several new employees, and built a brand new building off Station Road to accommodate them. From there, the team conducted all software development in-house and brought the first electronic edition of calculus to the Internet. Unfortunately, they didn't have much time to get cozy in their new location, as the construction of the Bayfront Connector forced them to seek a new home. Larson Texts found what appears to be their permanent residence in the former Belle Valley Elementary School on Norcross Road, where they have been encamped since 2000. The addition of a four-story, $6 million annex (slated to be finished by Christmas) suggests they'll be sticking around a while. The greatest catalyst behind the expansion has been Big Ideas Learning. Now a decade strong, the Big Ideas brand is a self-contained entity, published in-house (Larson's work is contracted out to other publishers) and entailing everything from kindergarten to advanced calculus. No matter what level is being taught, the company abides by a single unifying philosophy: "Student-friendly. Teacher-friendly. Parent-friendly." 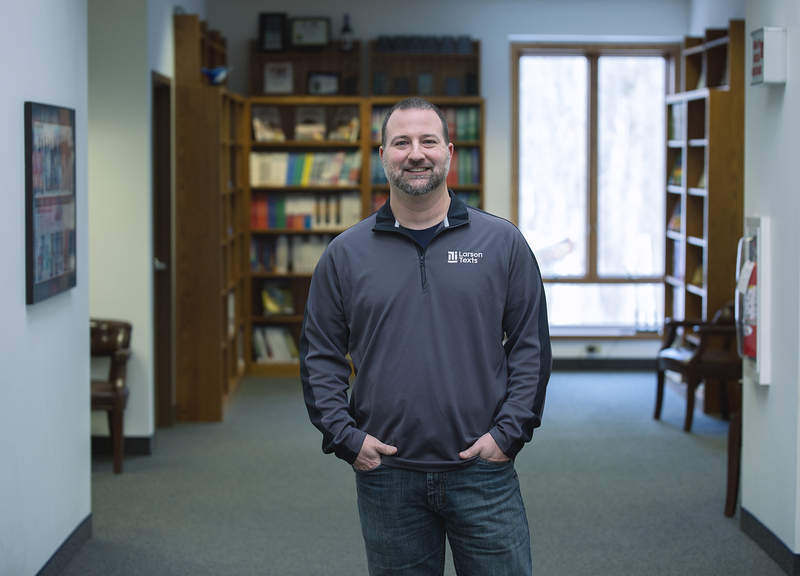 CEO Matt Totzke, who has been with the company since he was an undergrad intern barely 18 years of age, characterizes the operation as a "full service math shop." The writers and editors of the texts are all highly-qualified mathematicians or educators by trade, and the graphics design and software components are likewise handled on-site. Much of this talent is local, given the four area universities, especially nearby Penn State Behrend, with whom Larson/Big Ideas maintains a close relationship. Matthew Totzke started at Larson Texts as an intern in college and ascended to the rank of CEO. The Big Ideas brand, published in-house, has been pivotal to the company's success since its inception 2008. "We try hard to attract that talent to stay here with us," says Totzke. "We invest in the student as an intern in the hope that as a postgrad, we can get them to stay. We measure salaries and benefits relative to other major companies around here. Our next step is making more community inroads. There is untapped potential for us to be more helpful in the community because we are an education provider." Have you ever lived with an ornery child, a nagging spouse, or an overbearing parent? You probably wouldn't trade them for a pipe organ because you love them (or something). But for the sake of argument, I'm here to tell you that a pipe organ is much more low-maintenance. In fact, generations may pass before it needs tended to. If you're shopping for a brand new pipe organ, you're doing it for the long haul — these instruments can (and do) endure for centuries. Whether you're repairing or upgrading an old organ or starting from scratch, Organ Supply Industries — America's largest organ supply company — is likely to be involved. Organ Supply Industries traces its lineage through two men: Anton Gottfried and Fred Durst. Gottfried established the National Organ Supply Company in 1920, specializing in metal organ pipes. Durst, who served as Gottfried's superintendent, founded the Organ Supply Corporation in 1924. Durst's brother, Val, meanwhile had formed his own operation, Durst & Company in 1926. The National Organ Supply Company pipe shop was acquired by the Organ Supply Corporation (under Fred's son Carl) in 1958. In the early 1970s, Fred Gluck purchased both Durst-led companies and consolidated them under one name, Durst Organ Supply Company, Inc. In 1978, it was finally rechristened Organ Supply Industries, Inc.
Physically speaking, OSI's 45,000 square foot manufacturing space is nestled in the southwest corner of an industrial park off West Grandview Blvd. Metaphysically, the facility seems to occupy a different corner of time, as a team of skilled craftspeople cut, shape, assemble, and fine-tune the incredibly complex instruments piece by piece. 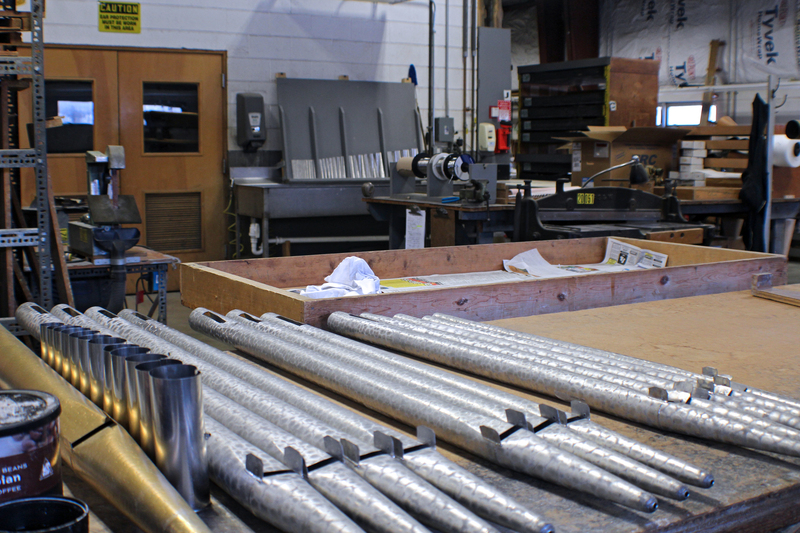 Organ pipes, formed from an amalgam of tin and lead, are one of the many components carefully crafted at the Organ Supply Industries facility. "This is a timeshare shop that allows craftsmen to continue their art around the world, all serving music in the end. It's like having Steinway in your backyard," says resident organ builder Bryan Timm. OSI's handiwork can be found "everywhere from St. Patrick's Cathedral [Erie] to Crystal Cathedral [Garden Grove, Calif.] and all points in between." Globally, you can find examples as far afield as Barbados, Ingelheim (Germany), Sydney (Australia), and the Philippines. OSI has the manufacturing capability and flexibility to apply itself to most any project, which is not only good, but necessary for a highly specialized business. "The instrument has to be assessed for the needs of the congregation. It's like investing in a mobile home versus a house," explains Timm. "The most critical things are that it makes logical sense and the instrument is serviceable. Otherwise you're building something that is going to die on the vine." To ensure the longevity of their instruments and their company, OSI's business model is to "interface and supplement other organ builders with our shop where they have deficiencies." Continues Timm: "We've invested in modern machinery and we all share in it. We don't do advertisements; they come to us because of our expertise." That expertise is hardly recognized outside the industry, as most of the organs are branded under another company's name. That doesn't matter to Timm, even for organs he designed from the ground up. What matters most is "that every dollar that comes into Organ Supply that goes to our employees is spent within the community. The revenue stream is global." Whatever name you want to put on it, if the product came from OSI, you can bet it both started and ended on a good note. One of Erie's largest and most successful industries can be summed up in just one word: plastics. There's a great future in plastics. An important piece of that future is the ever-growing Beaumont Technologies. Founded in 1998 by John Beaumont, the company began as a two-man operation at Penn State Behrend's technology incubator. Today, they just moved into a 42,000 square foot building on West Ridge Road. The company helped develop and patent an innovative technology known as the MeltFlipper® runner. Designed to control plastic flow in an injection mold, this technique used to run together molded parts helped improve consistency and reduce wasted material. John Divins of Erie works at an injection machine at Beaumont Technologies, founded in 1998 by John Beaumont. The company patented the MeltFlipper® runner, which controls plastic flow in an injection mold. "We can help you from concept to reality, though every step of the project," described John's son Alex Beaumont, who serves as the company's director of business development. From initial design concepts to the final physical product, the company participates in nearly every facet of the process. 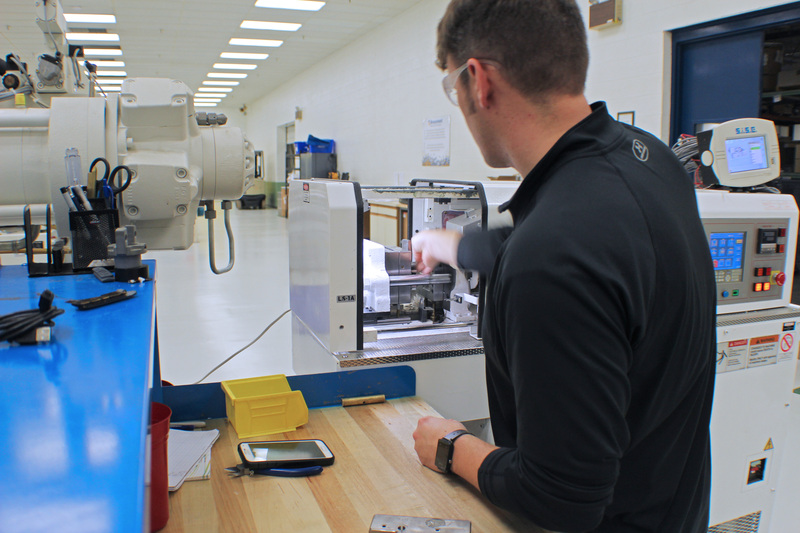 "We deal with so many different things, but it's all focused towards the plastic injection molding industry," Alex explained. Not only that, but for four years, they've ran the American Injection Molding (AIM) Institute focusing on training and education all centered around plastics. Bringing in people from all over the country, the AIM Institute has evolved and grown alongside its parent company, proving itself a success in its own right. Serving as chair of the Penn State Behrend Plastics Engineering Technology program for 20 years, John Beaumont continues to educate new generations of plastic engineers. AIM's flagship program, the Plastics Technology and Engineering (PTE) Program, was recently accredited by the American National Standards Institute (ANSI). "There's so much opportunity for growth. It's just such a bright spot with everything that we're doing here, focused on growth and innovation, and giving people jobs and keeping them here." Over in Lake City, one business is hard at work making components used in space travel, aircraft, and lifesaving medical operations. Constructing electronic connectors and cable harnesses, as well as power supplies, Airborn provides parts for a huge array of different uses. The Erie County operation began in 1988 in the form of CARON Enterprises, specializing in electromagnetic interference (EMI) and electromagnetic compatibility (EMC) electronic filtering. In 2001, CARON was acquired by Airborn, becoming one of 10 manufacturing sites for the company. Mary Durlin of Girard assembling a cable harness at the Lake City division of Airborn, which began in 1988 as CARON Enterprises, specializing in electromagnetic interference (EMI) and electromagnetic compatibility (EMC) electronic filtering. Director of Supply Chain Operations Jennifer Nelson, who oversees the company's Lake City facility, vouched that "it's an exciting company to be part of." Detailing some of the end uses of the company's products, she noted that "we support most of the large military contractors, Lockheed Martin, Raytheon, BAE Systems, General Dynamic — that's who we sell to." One of the unique products made on site is a printed circuit board used for heart catheters. The local facility recently had a job fair, looking for 40 to 50 new employees, to fill its first shift and add a second shift. "We're excited to be a manufacturer that's growing in the Erie County area. We're growing, and we have been consistently over the last couple years"
As an employee stock ownership plan (ESOP) company, Airborn is in the top 100 largest companies, according to the National Center for employee ownership, being 100 percent employee-owned. "We give people that are in the Erie County area the opportunity to create a career for themselves and build personal wealth, and build for retirement." 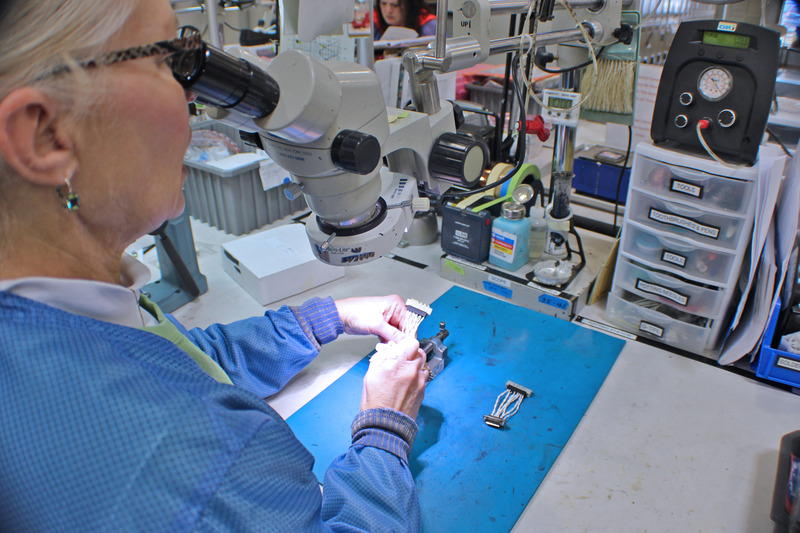 In addition to hiring experienced electronics assemblers, the company also offers entry-level positions, training their employees to industry standards for things like soldering and cable assembly. Nelson was happy to note how they fit into the area's business mosaic, expressing that "Airborn not only creates a place where you can live, work, and grow your career, but you can also be part of your community." When disaster strikes someone, every second counts. Trained first responders, such as paramedics, EMTs, and firefighters need to have a clear, well-organized system at a moment's notice. One company in Erie is actively making a difference, cutting down the time it takes to save someone's life. Code Kit PRO produces specially designed medical packs for Platform Resuscitation Organizers (PRO). Developed by Dr. Paul Malaspina of Erie, Code Kit Pro brings together important tools needed by trained responders, as well as products designed for civilians in emergency use. The company's offerings range from small "bystander" kits to fully stocked professional-grade systems. The most streamlined offering, the "bystander" kit is designed to help with bleeding control and hemorrhaging. In its clear pouch, it contains gloves, scissors, gauze, larger dressings, a Coban-type wrap, and a tourniquet, with illustrated instructions. In addition to this model, two more additionally complex bleeding control kits are offered. Developed by Dr. Paul Malaspina of Erie, Code Kit Pro brings together important tools needed by trained responders, as well as products designed for civilians in emergency use. One of the larger flagship kits is the PEDI-PRO, designed for use by trained first responders to aid children in emergency situations. The size of a small duffel bag, the kit folds out, providing a small mat with a dozen clear storage compartments housing endotracheal tube sleeves, airway tools, devices to start IVs, catheters, and much more. As part of the Erie Tech Incubator at Gannon University, Code Kit PRO is gaining attention as a small company. It received pre-seed funding from Ben Franklin Technology PArtners, and in January, they received the Pennsylvania Acceleration Project's Technology Accelerator Award. Their kits are used in schools, and in notable local companies, such as Erie Insurance. The company's tagline is a simple one, "Innovate. Resuscitate." Founded with a noble vision built on decades of experience in the field, Code Kit PRO is one of the many local companies doing something new and different to help our community. Together, each of these businesses fit together to create a distinct image, building on the past while always looking to the future, they're leaders of innovation, industry, and entrepreneurship.